I've recently retired my beloved Panasonic LX-3 after 4 years of faithful service. It's been to Tokyo, Osaka, Singapore and other faraway places and it's never let me down. It's replacement? I don't know yet, but I'm testing the discontinued Ricoh GR Digital IV. Why test a discontinued camera you ask? Unlike many digital cameras that are easily forgotten, for some reason the Ricoh GR series cameras tend to be come cult classics as soon as they come out. 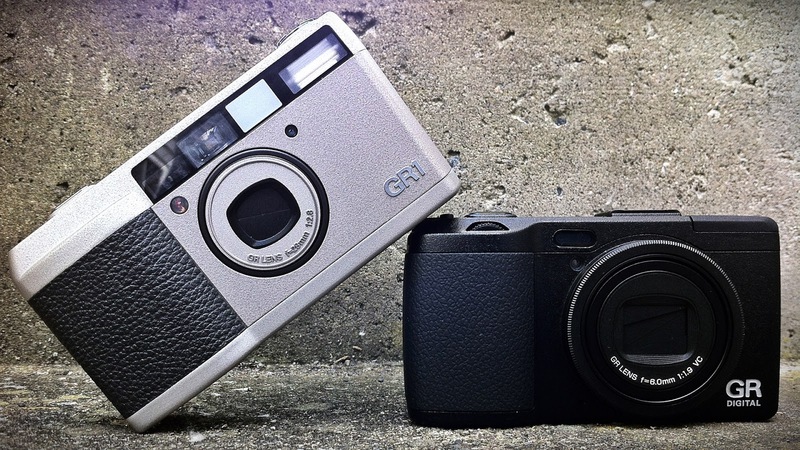 From the original GR-1 film camera (pictured above with the GR-D IV), to the latest and greatest APS-C sensor equipped Ricoh GR V (I know that's not the official name), Ricoh cameras seem to have staying power. Just type in Ricoh GR on E-bay or Craigslist and you'll see what I mean. I actually bought the original, the Ricoh GR-1 back in May of 1998. I remember this month and year not because I'm an equipment nerd (ok, I kinda am...), but because I bought it for my honeymoon. We were going to Vegas, and although I lugged my Minolta 7xi, 35mm F1.4, 24-85mm F3.5-4.5, and 80-200mm F2.8, I felt I needed a small compact for the times when we had an evening out and didn't want to carry a big heavy camera bag. Also, back in the film days, you had to commit to a roll of film, so I put black and white film in the Ricoh, and colour slide in the SLR camera. By the end of the photo trip... I mean honeymoon, including a drive to Hoover Dam and the Grand Canyon, I have to say that I had a blast shooting with the little GR-1. When we got the pictures back, I was even more amazed that the images were just as sharp as my big SLR lenses!! Ever since then, I've always dreamed of owning a digital Ricoh GR... so when I had the opportunity to test the recently replaced Ricoh GR-D iv, I jumped at the opportunity. I will post a full review in the next couple of weeks, but so far so good. Like the original, you can tell it was designed by photographers for photographers. It's in the small details. As you can see by the pictures, I still own the original GR film camera. I compared it size-wise against the GR-D IV and it's very similar. 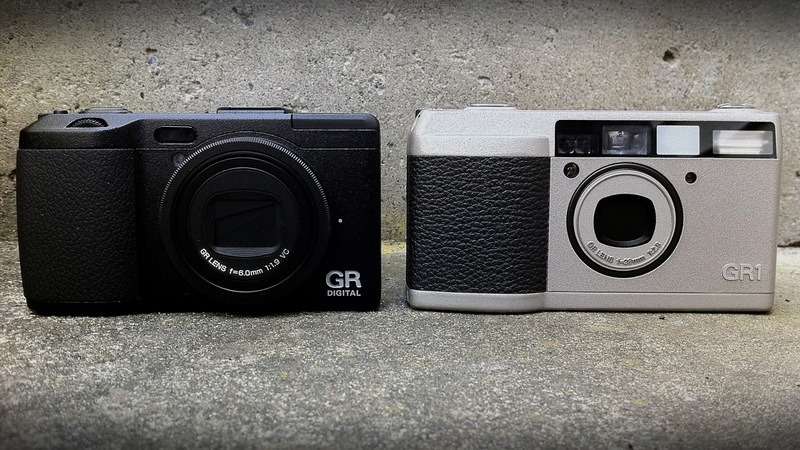 The GR-1 is a bit slimmer, but the GR-D is a bit narrower and shorter. In fact, I'm using my original leather case for the GR-1 with the new GR-D! I've attached this image to show how beautifully the GR-D can capture light. 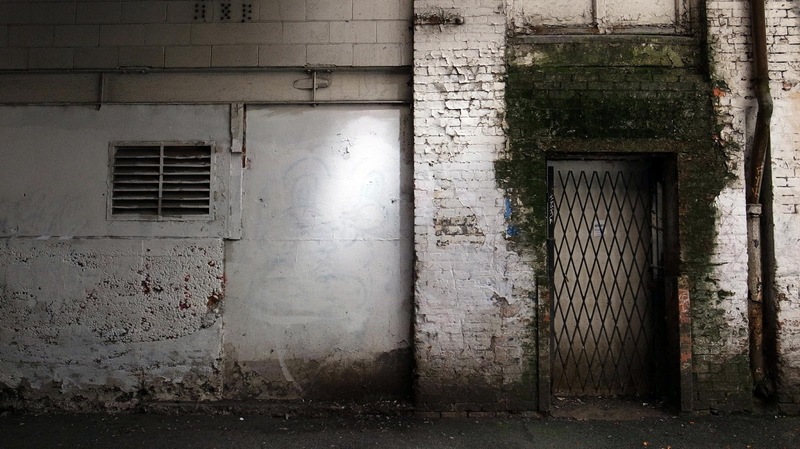 A dark alley with a bit of light shining through the buildings above. I didn't adjust this image except for a bit of sharpening and some tone adjustment...that's it. Even the vignetting is natural to the way the wall was being lit. So far I'm really enjoying shooting with the Ricoh GR-D. I know all the rage right now is the new GR, and people should be excited. I'm looking forward to testing it soon myself. But don't discount the small sensor GR-D IV. It's just as enjoyable to shoot with, with the advantage of image stabilization (the new GR V doesn't have it), a faster lens (F1.9 vs F2.8), and because of the small sensor, a greater depth of field, something street photographers love! I've taken lots of pictures so far with the GR-D, so I'll slowly start posting them prior to my full review of the camera in the coming weeks. Thank you Pansonic LX-3 for being my constant photographic companion the past 4 years. Your 24mm equivalent F/2 Leica designed lens will be missed!! Please take care of her Zach! !